In 2017-18 32 TRAs received 51 getting involved grants totalling over £132,000 to run activities for residents. After school clubs (Edmundsbury & St Matthews). Art classes (Lilford & Vauxhall Gardens). Football programmes (Deronda, Portobello, Streatham Hill and Vauxhall Gardens). Children's summer programmes (Albert Carr, China Walk, Deronda, Fern Lodge, Lilford, Portobello, Streatham Hill and Tulse Hill Estate). Young People’s Theatre (China Walk). There were also 32 single day events held which were mostly TRA launches, fun days and Christmas events. This list doesn’t even include the many activities that TRAs funded themselves or received funding from other sources, so it was clearly a very busy year! Our TRAs deserve every credit for all of their efforts so THANK YOU! Melbourne Mews TRA were unhappy with the fly tipping on their road so teamed up with Urban Growth, our environmental improvement partner, and our Estate Pride team to design out the problem. 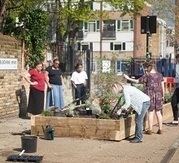 They agreed a large raised bed would deter would-be fly tippers so with Urban Growth doing the construction, the TRA got a group of residents to have a planting day last Saturday week - and very successful it was too! As reported in last month’s newsletter, all three Area Boards have now met for the first time and elected chairs and vice-chairs. The chairs and vice-chairs meet together as the Coordinating Committee (CC) together with Cllr Jennifer Brathwaite, and Neil Wightman, Director of Housing Services. It is the Coordinating Committee that decides what the main priorities for service review are. These service reviews will then be progressed by resident led Task and Finish Groups (TFG) who will look in detail at the service in question before making recommendations for improvement. When the CC met recently to consider the feedback from the Area Boards it was agreed the overriding priority was repairs. Being the first review it was felt important not to make the brief too wide so rather than include all repairs it was decided it would be best to concentrate on communal repairs. The CC now needs to decide the terms of reference of the TFG and who will sit on it. It is hoped to get this group up and running by June. If you are interested in getting involved in either the Area Boards or the TFGs please contact Erin Healy on 0207 926 8299 or email gettinginvolved@lambeth.gov.uk. The two main housing contracts - the capital contract LHS and the repairs and maintenance contract LPC - will need to be re-tendered in 2019 as the current ones expire in 2020. We will be looking for residents interested in sitting on the reprocurement panel to work with officers on the strategy and tendering of these key services from this Autumn. If you are interested in being on this panel or knowing more about this please email gettinginvolved@lambeth.gov.uk with Procurement Panel in the subject. There has been a number of major refurbishments of our estate facilities this past year, more than in any previous year. 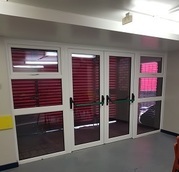 We are very pleased that these facilities have been refurbished and look forward to residents maximising their use in future. Refurbished kitchen, new flooring and repainting of Notre Dame Estate hall. Streatham Youth Club are partnering with TMP master classes to put on weekly sessions for 14 to 21 year olds interested in learning a range of musical skills. The skills covered at the master classes include learning how to produce beats, record, mix and master vocals as well as improve their lyric-writing skills. On top of this, there will be the opportunity to learn DJ skills. 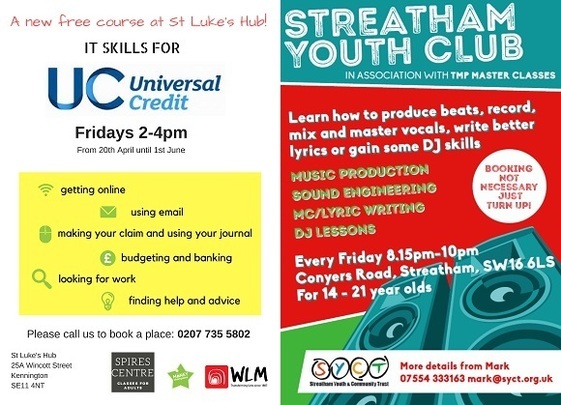 The sessions are every Friday, 8:15pm to 10pm at Streatham Youth Club, Conyers Road, Streatham, SW16 6LS.